Per Capita has today announced the appointment of two new directors to its board, and the retirement of two members who have served the think tank for many years. 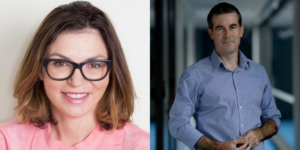 Dee Madigan, Director of Campaign Edge, and Tim Kennedy, National Secretary of the National Union of Workers, will join the Per Capita board. With over 20 years’ experience in the advertising industry, Dee Madigan is a creative director who has developed integrated campaigns for some of the world’s largest brands, including HSBC, Coca-Cola, J&J, Unilever and Nestle. She has been a winner or finalist at almost all major advertising awards, including Cannes. Dee understands the need for creativity as a tool to persuade an audience; she understands that effective messages are always based on brand truths and she knows how to develop and roll out a truly integrated campaign, from TV ads and traditional media, through to digital and social media. Dee is one of Australia’s most experienced political campaigners. She has been Creative Director on over 10 elections, including the 2015 Qld election as well as the 2016 ACT and NT elections. She is the author of The Hard Sell (MUP 2014) and is a contributing author in Change! Combining analytic approaches with street wisdom (ANU 2015) and MotherMorphosis (MUP 2015). She is a regular panellist on ABC’s Gruen and a political commentator on Sky. Tim is National Secretary of the National Union of Workers. Over Tim’s twenty years at the union, he has worked as an organiser, industrial officer, assistant national secretary, Victorian branch secretary and national president. His time at the union has seen increased worker-led activism and the creation of the NUW’s Community Membership, which is beginning to build links between NUW industrial activists and community activists for equality, decent and secure jobs, and a Fair Australia. They replace outgoing directors Joshua Funder and Geoff Gallop, both of whom have served the board with distinction. Dr Funder, a co-founder and past Chair of Per Capita, said “I’m proud to have helped build a clear, independent voice for equality in Australia”. Dr Gallop, who joined the Per Capita board in 2014 said “I’ve very much appreciated the opportunity to contribute to Per Capita and its quest for fairer solutions than those currently on offer. It’s an agenda that needs our continuing support”. Per Capita Chair Helen Conway thanked Drs Funder and Gallop for their service, saying “It has been wonderful having Josh and Geoff on the Board. As a founder, director and Chair for a period, Josh has made a very significant contribution to Per Capita. Although Geoff was on the Board for a shorter period, he added great value particularly given his policy expertise”. She welcomed Ms Madigan and Mr Kennedy to the board, saying “Dee and Tim bring fresh eyes, expertise and energy to the Board and I’m very much looking forward to working with them”. Ms Madigan said “The only way to stop rising inequality is to interrogate existing assumptions about our economy and the community it serves. I’m excited to join the Per Capita board and take on the challenge to help make our society a place in which everyone has equality of opportunity and a decent standard of living”. Mr Kennedy said “Challenging the notions of what creates a fair society and proposing solutions for all citizens is an important project. I appreciate the opportunity to represent the voice of workers in the critical thinking being undertaken by Per Capita”. The new Directors join Per Capita’s existing board of Ms Conway, non-executive director and inaugural Director of the Workplace Gender Equality Agency; Deputy Chair Jacob Varghese, CEO of Maurice Blackburn; Maxine McKew, Vice-Chancellor’s Fellow at the University of Melbourne, former journalist and MP for Bennelong; Marion Webster, Executive Director of Kilfinan Australia and founding Executive Director of Philanthropy Australia; and David Hetherington, Executive Director of the Public Education Foundation and Per Capita’s founding Executive Director.